A weekly exploration of my CSA box. Fascinating. A long time ago (around Week 14, I believe) some rutabagas appeared at my home. I didn’t really know what to do with them, so I turned to that great vegetable bible, Deborah Madison’s Vegetarian Cooking for Everyone. Debbie had a recipe in the rutabaga section for rutabaga fries. 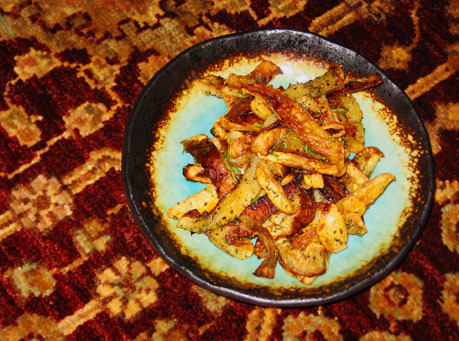 I like snacks, more than the other wholesome sounding things on offer in rutabaga futures, so I made the fries. It involved cutting them up and baking them on a cookie sheet with olive oil, and then tossing them with with salt and pepper and minced fresh rosemary. Much like sweet potato fries, they didn’t get crispy or anything, but they are interesting. Weirdly, they kind of remind me of roasted garlic, in color and texture and even flavor. Odd. But nice. Now I have never met a vegetable I didn’t like (with the sole exception of cooked bell peppers – blech), and I am especially a great friend and lover to all root vegetables. So I kept doggedly plugging along with the turnips, trying recipe after recipe, figuring I must not have found the right showcase for these lovely white roots. And while the turnip souffle was lovely, tinged with pink, and the curry was gorgeous, the fiery colors of a sunset, and the bisque was universally liked by my dinner guests, each dish has ended up tasting somewhat… wrong. I am the type of person who scoffs at people who don’t like a certain vegetable. Hate brussel sprouts? I am convinced you’ve always had them either over- or undercooked. Refuse to eat beets? Perhaps if you tried them not from a can… So I know, intellectually, that turnips are one of those frequently reviled foods, foods that people complain about having been forced to eat as a child. But I always considered myself to be immune, above that, even. But I think that now, after many weeks, I must at last concede. The turnip, and possibly even its friend and companion the rutabaga, is just not for me. So many people have written to me to say they are enjoying the blog and the recipes, which makes me so happy! I definitely created this to share with the CSA and the prospective-CSA community, and I love knowing that I am helping people find new ideas for what to do with what comes in their boxes. I wanted to explain, however, why there are a lot of dishes that I photograph and write about where I don’t give the recipe. Partly this is because the intention of many food blogs is to share recipes with notes about how they turned out and so on, and the intention of mine, of course, is to let people know what it’s like to get a CSA box. The main reason that a lot of the most wonderful things I cook are coming to you without instructions for how you might reproduce them yourself is because I get my recipes from 4 main sources: the internet and the three cookbooks shown above. These three books are my go-to books for any vegetable, any time, because the recipes are easy to make, beautifully laid out and well explained, and there are enough vegetarian, vegan, and gluten-free dishes to make owning the books worth my while. But, because I’ve cooked at least half the dishes in each of these books, if I posted each recipe as I made it I would feel like I was robbing the three women whose terrific cookbooks are a cornerstone of my kitchen. So instead I will urge you all to check out Sara Deseran’s lush and comprehensive Asian Vegetables, Ruta Kahate’s Indian-made-joyously-easy 5 Spices, 50 Dishes, and Deborah Madison’s “somewhere between the bowl of cereal and the all-out dinner party” Vegetarian Suppers. If you have any questions about the books or want to know more about why, with a groaning shelf full of choices, these are the ones I adore, please don’t hesitate to ask! I mentioned in a recent post about tat soi my proto-dinner, the meal from which all other meals spring. (Okay, so that’s a bit of an exaggeration, but if all cooks have a meal they can rely on, make in their sleep, fit to suit the occasion, and, most importantly, are pretty much always in the mood for, then this is mine.) Tonight, at the bare dreg ends of my last box (even the lettuce is gone! but not the napa cabbage, of course), I had to break down and buy myself some kale. Yes, at the store. My new box comes tomorrow and, seeing as how it is winter, and that the universe is a good and loving place, there will probably be kale in my box. But sometimes a girl needs kale, and she needs it now. So I bought some kale at the store, and I mixed some red and white quinoa and threw it in the steamer with some broth and I cooked up my Deborah Madison simple tofu and I put it all on a plate and man, it was just perfect. So perfect I could eat it every night this week, and maybe I will, when my box arrives all full of kaley goodness. Slice the tofu into thin slices (see photo above). Lay slices on paper towels and pat down with more paper towels (this allows you to skip the offputting tofu-pressing step so often required, and Debbie says it’s okay, so it must be legal!). Heat the oil over medium or medium-high heat in a pan big enough to lay all the slices flat. Put the tofu in the pan. It may skitter and sputter at first because of the water in the tofu. It’s all good. Sprinkle salt and pepper on the tofu (don’t go overboard with the salt since you will add soy sauce in a few minutes). When the tofu has browned on one side, flip it over, sprinkle soy sauce over the tofu, and let the soy sauce kind of get sticky and evaporate in the pan, leaving a yummy crusty layer on the tofu. As winter closes in, I find myself really craving comfort food. This afternoon, as I walked home through the chilly fog, I got a yen I haven’t had in years. I wanted tuna casserole, that ultimate comfort food, the kind with the crusty broiled top and the simple-but-brilliant filling of macaroni, tuna, and Campbell’s Cream of Mushroom soup all mushed together and seasoned with nothing but parsley, salt and pepper. I don’t eat tuna anymore, and I don’t eat wheat pasta, and I sure as hell don’t eat whatever craziness they put in a can of Campbell’s, so my casserole tonight was a bit of an adventure, but in the end it came out perfectly and filled my tummy with warm, gooey, winter coziness. I have no photos, no adventures to recount or culinary masterpieces to share, but the tat soi was so lovely it deserves a mention rather than slipping quietly from the box into anonymity. Tonight it was time to tackle the turnips. I still had the white “Tokyo” turnips from Week 4 and the “Red Scarlet” turnips from Week 6. I was especially curious about the unusual red scarlet turnips, although I’m pretty unfamiliar with turnips in general. 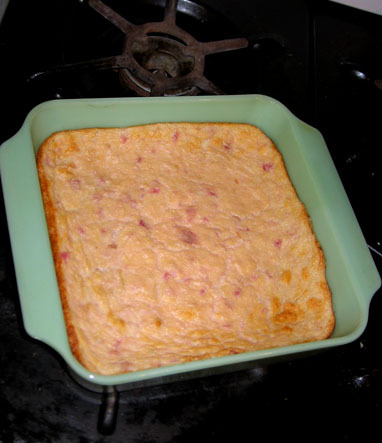 I googled about and checked out turnip recipes, and ended up with a kind of turnip souffle, which was basically mashed turnips mixed with roux, soymilk, a little sugar, and egg yolks, with beaten egg whites folded in. I left the skins on the turnips, so my (unfortunately not very photogenic) souffle/cassrole thingie ended up with lovely little pink flecks as well as an allover rosy glow. The flavor was light, savory, eggy, and a little sweet from the turnips. 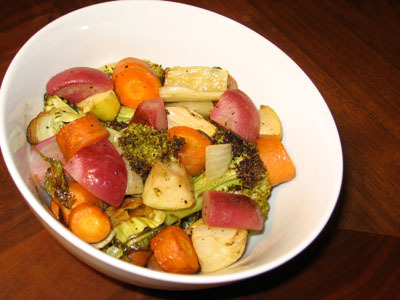 I also wanted to see what the turnips were like roasted, since roasted roots in the form of beets, parsnips, and carrots are already one of my staple foods. I ended up making a kind of “refrigerator roast,” roasting an unlikely combination of everything in my fridge that looked remotely roastable. I put together a concoction of scarlet turnips, white turnips, carrots, onion, garlic, broccoli, and a green apple I found abandoned at the back of the middle shelf, all seasoned with some of the sage left over from the Quinoa Butternut Pie. I followed Deborah Madison’s instructions for roasting turnips from Vegetarian Cooking for Everyone, which is usually my veggie prep bible. In this instance, though, Debbie let me down. She had me boil the turnips for 3 minutes before roasting, and they ended up more soggy than delightfully caramelized. (Probably because my turnips were much smaller and more tender than the typical huge lavender-tipped turnip of the traditional root cellar.) They were lovely to look at, though, and quite tasty to eat in any case. Tonight for Libby’s final meal I made a Chard, Spinach, and Onion Torta from Deborah Madison’s Vegetarian Suppers. For the first time I really experienced that feeling I’d hoped to find by getting the CSA box – that sense of spontaneous discovery and trying new things based on whatever arrives. I mentally reviewed which veggies I still had left (a mighty surplus, I’m sad to report, since my next box comes tomorrow!) and then flipped open a favorite cookbook. 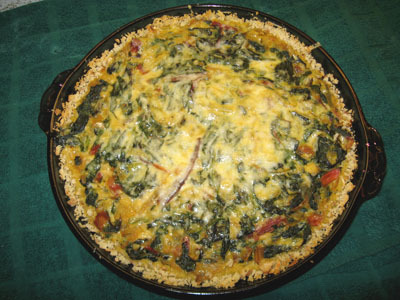 The first recipe I flipped to was this torta, which I’d never made before, and, by substituting a bag of spinach for one of the two bunches of chard the recipe called for, I was able to use my large bunch of rainbow chard, that bag of spinach, an onion, and some garlic. It was a perfect recipe to make tonight because it calls for a bread crumb crust. I never have bread in the house, but tonight I had half a loaf of getting-stale Grace Baking rosemary-potato bread I’d bought for Libby as a must-try Bay Area favorite, and the flavor it added to this dish was phenomenal. It basically makes the whole thing shine. (Not to knock the “light cream” I invented out of a mixture of broth and kefir, of course! I took several creative liberties with the recipe, as is my habit.) This was basically a full-meal dish, but we accompanied it with a salad of lettuce, radishes, carrots, and green beans from previous weeks’ boxes. Who Will Eat the Goat?